Readers tend to highlight important sections of documents in a vivid colour and leave the content beneath the marked area readable so that they can make a quick reference to these sections easier and faster. Of course, when reading books, notes can easily be marked using highlighters. But how about marking on a web site? Well, if you are using Firefox, you can try the Wired-Marker, an add-on to Firefox. Wired-Marker is an interesting permanent online highlighter for marking web pages running in Firefox browser. You can use it to highlight images, texts or anything on the web. The marked content will be automatically recorded and saved. It saves a lot of your time to extract key points when you revisit a web page. Wired-Marker allows you to choose from a variety of colours and styles such as red for critical, green for very important, etc. 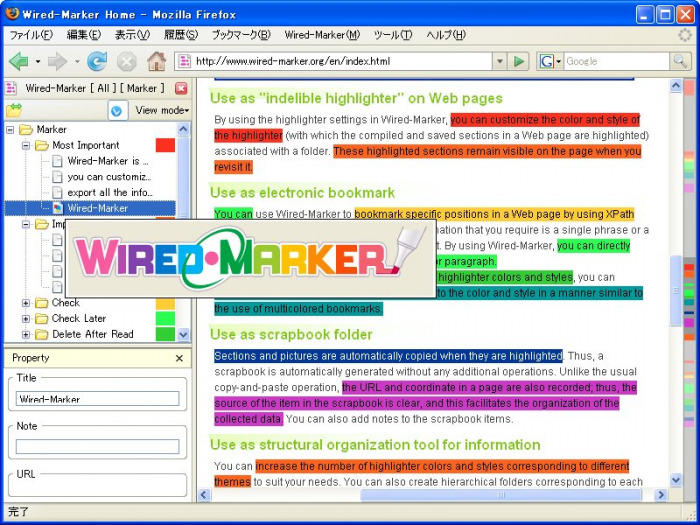 Wired-Marker is a freeware. Users can download the free Firefox addon via the link here.